You won’t read about it in the newspaper, but something historic happened in Butte on April 18. Usually meetings on the company’s energy procurement plan draw an audience of a few yawning technocrats to watch several NorthWestern Energy (NWE) PowerPoints on the utility’s “variable generation resources” of “stably and reasonably priced” energy. Climate change isn’t allowed into the room. Something new happened last Wednesday. Around 70 activists and renewable energy entrepreneurs crowded into a presentation by NWE energy planner John Bushnell and peppered him with questions for over an hour. A congenial man facing a skeptical audience, Bushnell did a solid job laying out the company’s concerns about a gap in electrical energy during peak hours. Bushnell’s many charts and visuals showed that NWE’s minimum load is around 440 megawatts. Its 350,000 customers will demand about 600 MW on an average day. But during the peaks in both summer and winter, the demand can blow up to 1,200 MW. The company uses its hydroelectric dams, its partial ownership of one of the Colstrip coal-fired generators, the spot market, some required federal sources, and a variety of smaller generators, including 280 MW of wind and 27 MW of solar electricity to match up to the electricity demand. Bushnell believes the company will increasingly fail to meet his industry’s “reliability standards” as the major owners (West Coast utilities) decommission the Colstrip coal-fired generators in the next few years. That’s why the company wants to build $1.3 billion worth of new natural gas generators, pipelines, and infrastructure. But, the Montana Public Service Commission (PSC) rejected that plan over a year ago and told the company to write a new plan by December 15. The meeting this week is the first of only two hearings where “stakeholders” can comment. It sure seemed like the company was headed in the same direction. Two dozen citizens — including seven from 350 Montana — rose out of their seats to speak after Bushnell’s presentation. The elephant in the room, they said, was climate change and our need to reduce fossil fuels and greenhouse gas pollution. Many brought up the external costs, the methane leaks, and the unpredictable economics of natural gas. Others talked about how Montana’s world-class wind and solar resources could be paired with improved storage technologies to supply electricity during peak demand. One example is the 100 MW battery recently built in South Australia, and another is the 100 MW Gordon Butte pump-storage proposal near Martinsdale, Montana. Still others talked about the moral obligation of utilities and government to provide a stable climate for our children and grandchildren. Some told NWE officials to budget for a just transition for Colstrip workers and plan to clean up the coal ash ponds at Colstrip. One person said NWE should stop their lobbying against renewable energy in the Montana Legislature. I really don’t think company executives expected an hour and a half outpouring of such diverse, well-spoken comments. These are dark times, but I found it incredibly encouraging to hear the passion of people gathered in that small auditorium. 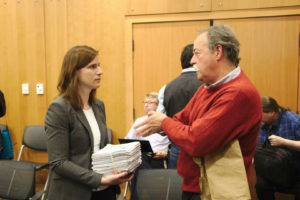 There will be another public hearing sometime in September, and, in the meantime, you can email your concerns about the company’s procurement plan to NWE to todd.johnson@northwestern.com. You can also write CEO Bob Rowe, NorthWestern Energy, 11 E. Park Street, Butte, MT 59701.